LabDiet Guinea Pig Diet is a complete diet that eliminates need for supplements. This product is formulated for maintaining growth, reproduction, lactation and maintenance of guinea pigs. The formula is specifically researched to help minimize tissue calcification, stillbirths, and pregnancy toxemia. In long-term studies, this is paired with the selection of highest quality ingredients to assure minimal inherent biological variation. This diet is a complete life cycle diet formulated using managed formulation delivering Constant Nutrition, while also containing proper amounts of stabilized Vitamin C. With an enriched diet, there is no need for supplemental greens. 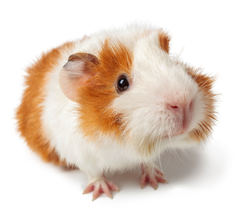 If you would like to view the nutritional information on LabDiet Guinea Pig Diet, click here. If you would like more information or wish to order LabDiet Guinea Pig Diet then please call our store at: 800-262-5258. We are located in Fort Worth, Texas. For any additional information or questions about LabDiet Guinea Pig Diet, contact us here.